Jaén is a city in south-central Spain, the name is probably derived from the Arabic word Jayyan, (crossroads of caravans). It is the capital of the province of Jaén. It is located in the autonomous community of Andalusia. The inhabitants of the city are known as Jiennenses. Its population is 117,540 (2006), about 1/6 of the population of the province. 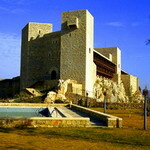 In the last years Jaén has had a great increase of cultural tourism. Jaén is also known as the World Capital of Olive Oil, because it's the biggest producer of this liquid gold (as the locals refer to it). The urbanism of Jaén is determined by its adjustment to the hills of the Santa Catalina mountains, with steep, narrow streets, in the historical central city district. The city of Jaén is the administrative and industrial centre for the province. Industrial establishments in the city include chemical works, tanneries, distilleries, cookies factories and textile factories. Jaén Cathedral, one of the most important Renaissance style cathedrals, began construction in 1570 and was completed in 1802. It is dedicated to the Assumption of the Virgin, and it was built to shelter the relic of The Holy Face, or Veil of Veronica, lodged at the major chapel and exposed to the public every Friday. Due to the length of time in its construction, different artistic styles can be appreciated, the most prominent being Renaissance; Andrés de Vandelvira the most important architect. He is the greatest exponent of the Andalusian Renaissance. It aspires to be listed as a World Heritage Site by UNESCO. Saint Catalina's Castle (Castillo de Santa Catalina) sits on the top of a hill overlooking the city. Previously there existed a fortress of Arabic origin (Abrehui's castle), of which some remains still exist. The current construction is of Christian origin, raised after the conquest of the city by Ferdinand III of Castile, called the Saint, in 1246. Arab Baths, the most significant remnants of the Moorish era of Andalusia, are the largest Arab baths preserved in Spain. They can be visited under Villardompardo's Palace (another important monument in the city). Other important monuments are the Museum of Arts and Popular Customs, the International Museum of Naïf Art, San Andrés's Chapel, the Provincial Museum of Jaén (which shelters an important collection of archaeological Iberian remains), Saint Ildefonso's church, etc. The city has the University of Jaen, which nowadays consists of approximately 15.000 pupils and 27 degrees. This university is present in the city, in the Campus "Las Lagunillas", but also is present in Úbeda and Linares with only some degrees. The university is very modern with a large foreign student population. In Jaén the culture of the tapeo is very common, numerous bars exist where for the price of a beer (1 or 1,5 €), you eat a tapa, which consists of a small plate of food for one person. A legend of a large lizard is commonly associated with the city of Jaen. The gastronomy of Jaen is very varied, emphasizing local dishes such as the pipirrana (tomato, green peppers, breadcrumbs, garlic shoots, olive oil, vinegar, salt and hard-boiled egg); "spinach a la Jaén" (garlic, croutons, spiced sausage, bayleaf, egg, orange zest and vinegar); "rice a la Jaén" (very weak), "veal with chopped garlic", "trout from the rivers of Jaén" (trout, butter, chunks of ham with bacon, parsley, white wine and salt), "ajo blanco a la Jaén" (raw almond, olive oil, eggs, garlic, salt, vinegar and water). Among the most well-known confectionery of Jaén is "rice pudding", "gachas of Jaen" (a sort of porridge), "pestiños", "gusanillos" and "ochíos". The football team of the city is Real Jaén and they play in the New Victoria Stadium. The city has two major sporting facilities: the Fuentezuelas and the Salobreja, together with the university sports facilities. Trekking and climbing associations also exist, such as El Lagarto and Jabalcuz. Also of note is a Green Route called Vía Verde del Aceite, which corresponds to an ancient tracing of the iron seam from the beginning of the 20th century that united Jaén with Puente Genil (Córdoba province) known as "The Oil Train". There are various competitions which have a great international importance, for example, those related to chess and athletics. The most important event is the International Piano Competition Premio Jaén (in Spanish: Concurso Internacional de Piano Premio Jaén) that is the oldest and most important piano competition in Spain. It started in 1953 with Pablo Castillo García-Negrete, an architect who began to donate the first cash prizes of only some thousands of pesetas. Nowadays the prize consist of 57.000€ and the recording of classical music albums in professional studios. The last winner of this significant competition was the Chinese pianist Yin Yu Qin, in 2008, in the fiftieth competition. There are other events likes the Ciclos de Rock and the Lagarto Rock Festival.